Dec. 3, 2018—Today, the International Day of People with Disabilities, Global Ministries joins with organizations around the world to promote awareness of the challenges people with disabilities face, and the responsibility that communities and the church have to remove barriers to social inclusion. The World Health Organization estimates that approximately 1 billion people, or 10 percent of the world’s population, live with a disability. Global Ministries, on behalf of The United Methodist Church, works with partners all over the world to create enabling environments for full social inclusion of people with disabilities using community-based rehabilitation. Children with disabilities are particularly disadvantaged. Between 65 to 85 percent of children with disabilities in low-income countries do not attend school. For example, in Haiti UNESCO estimates that only 2 percent of disabled Haitian children are enrolled in school. 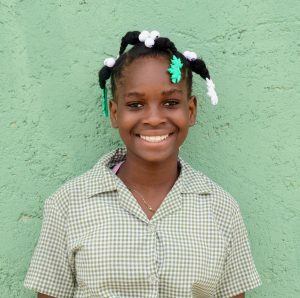 Through its partnership with the Haiti Deaf Academy, Global Ministries has awarded $45,633 in scholarships for deaf and hard-of-hearing children. 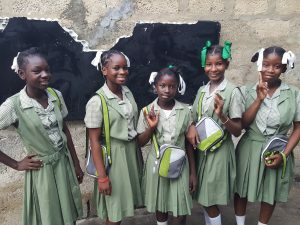 HDA is one of 10 schools providing education to deaf children in Haiti. In 2017, 46 children from all over Haiti lived together in two adjoining homes attending the school, filling it to capacity. The scholarship from Global Ministries helps the academy provide student transportation to the local primary school, language and life skills development, after-school tutoring, vocational training, housing and three nutritious meals a day to HDA students. The children also learn sign language taught by deaf adults who also serve as their guardians and Christian role models. Learning sign language opens new avenues of communication with the children. The school social worker ensures that families are in contact with their children and have access to sign language programs as well. When you arrive at HDA’S gate, you hear the sounds of children scuffling, grunting and laughing. As soon as you wave over the top of the tall gate, a throng of children, along with an adult guard, eagerly pushes the heavy door open. Happy sounds of the deaf children greet you; then the smiling faces and fast-moving hands begin asking you questions in Haitian sign language. Welcoming hugs follow. Usually, right behind the youngest ones, you will see the beaming face of Joulie, one of the teenagers at HDA. Joulie Stephanie Charles is a lovely young lady, who has been at HDA for the last five years. My name is Joulie Charles, and I am 14 years old. I grew up in Port-de-Paix in the Nord-Ouest part of Haiti. My mother heard about HDA from one of the school’s staff members. My mother was excited to find out that I could learn Haitian sign language, go to school, meet deaf peers and have safe housing. I was one of the very first students to arrive at HDA! I am so happy to come to school here and live at the dorm. I hope I can learn to be a seamstress once I complete my schooling. HDA has a vocational training program that will teach me to make uniforms, so I can have an income as I graduate from HDA when I am 18 years old. Maybe I can make all of the uniforms for HDA students and teach some of the younger girls to sew, too. My faith is very important to me. I have been baptized and help lead Bible stories for the younger students in the mornings before school. I would like to continue doing that after graduating from HDA. In many low-income and middle-income countries, only 5 to 15 percent of disabled people who require assistive devices and technology have access to them. This means that more than 900 million people do not have access to the wheelchairs, eyeglasses, hearing aids, prosthetics and other life-enhancing devices they need. Assistive devices and technologies help maintain or improve an individual’s functioning and independence to facilitate participation. They also enhance overall well-being. Global Ministries is increasing access to assistive technologies because of their importance for improved health outcomes, inclusive education, economic empowerment and participation in community life. 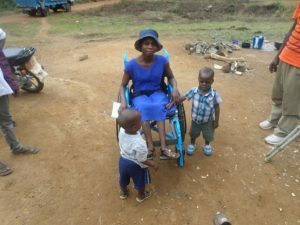 Providing wheelchairs in Liberia is one way Global Ministries has done this. In partnership with Free Wheelchair Mission, Global Ministries supported the distribution of 520 wheelchairs in the Ganta community of Liberia. A few wheelchairs were assigned to the Ganta Hospital for patient use. These wheelchairs are designed for durability in rugged terrain and to fit the physical structure and the physical condition of the identified recipient. One of the wheelchair recipients is Yei Bubu. She is a 45-year-old resident of Mongbain and the single mother of two boys. She became paralyzed at age 6. In Liberia, people with disabilities are looked upon with pity and often not seen as responsible members of their communities. Women are left particularly vulnerable. Yei has always walked with a set of crutches that were crudely made out of sticks. The crutches did not give her the balance she needed and compromised overall health. 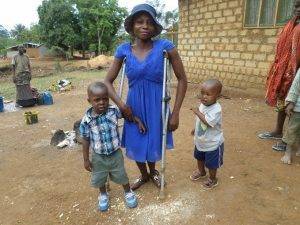 Yei told us, “I find it difficult to do normal duties because of the slow pace at which I struggle to walk with these crutches.” With the wheelchair, Yei can now move much faster to seek food for herself and her children. She looks forward to a future where, with her improved mobility, she will be able to manage a small market and live off the profit. For now, she is just thankful for the wonderful gift of improved mobility! In partnership with the Sierra Leone Health Board of the Sierra Leone Annual Conference, Global Ministries has expanded the scope of services provided by the Limb Fitting Program in Bo, Sierra Leone. The devastating 11-year armed conflict in Sierra Leone led to hundreds of limb amputations, mostly of men in the prime of their lives, depriving them from working opportunities. The Limb Fitting Program provides a simple lower-limb prosthesis called the “Jaipur foot.” The program was officially launched in 2003 in Bo. The UMC Limb Prosthesis Center produces about 10 to 12 lower-limb prostheses every month, enabling amputees to walk again and reintegrate into the workforce. The program continues to provide needed support, as new amputees arise from accidents and diseases like diabetes. In many settings, medical and rehabilitation services for people with disabilities are less than optimal or simply do not exist. This is often due, in part, to a lack of training for health professionals regarding appropriate medical care and rehabilitation services for people with disabilities. The Global Health Unit of Global Ministries has awarded $845,951 in grants during the 2017–18 fiscal year to strengthen and improve access to rehabilitation services, assistive technology and community-based rehabilitation. While we celebrate all of the ways United Methodists are working to improve the lives of people with disabilities, much remains to be done. Many of the barriers people with disabilities face are avoidable and the disadvantages associated with disability can be overcome when properly funded and supported. To support these efforts and more, give to Abundant Health, Advance #3021770.